We’d love your help. 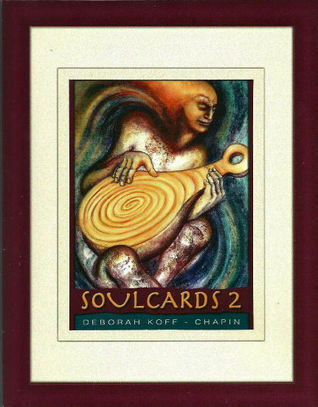 Let us know what’s wrong with this preview of Soul Cards 2 by Deborah Koff Chapin. This set of 60 evocative images will speak directly to your soul. The accompanying guidebook suggests creative ways to deepen your experience of the cards and foster personal insight. "SoulCards II" is complete unto itself, or can be used with its companion deck, "SoulCards I" (0964562308) to enrich the range of imagery. Use SoulCards by yourself, with a partner or in a gr This set of 60 evocative images will speak directly to your soul. The accompanying guidebook suggests creative ways to deepen your experience of the cards and foster personal insight. "SoulCards II" is complete unto itself, or can be used with its companion deck, "SoulCards I" (0964562308) to enrich the range of imagery. Use SoulCards by yourself, with a partner or in a group. Use these powerfully evocative images to stimulate personal insight, creativity, inter-relational conversation and more. The guidebook supports you to use your creative resources to delve into the images through journal writing, storytelling, visualisation, movement, dream incubation and other expressive modalities. When used in relationships and groups, SoulCards catalyse refreshing responses and authentic communication. Children are fascinated with the images, and often verbalise with unexpected wisdom and maturity. The uses of SoulCards are endless! Contains: 60 cards with 36-page book. Card size: 3.75" x 4.875"
To ask other readers questions about Soul Cards 2, please sign up. This deck of Soul Cards moved me in many ways just like the first one. Each card calls out to a special part of me, and the timing of certain cards being pulled is always amazing and perfect. I love the abstract artwork and interpreting meanings that relate to what I am going through. These are really wonderful to work with and for the inner-self to connect with the higher self. The cards themse This deck of Soul Cards moved me in many ways just like the first one. Each card calls out to a special part of me, and the timing of certain cards being pulled is always amazing and perfect. The cards themselves really provoke the psyche, your creativity, inner wisdom and intuition! I was considering purchasing those cards when I came upon a youtube deck review that showed all of the cards. I was stunned at how fast and clear was my interpretation of each one. Just a quick look at an image allowed me to understand it in my own way. At that point I knew that I must have them. The cards are amazing and so versatile that they can be interpreted in a number of ways, depending what suits one the most. I like the fact that there is no numbers or descriptions/ key words written on I was considering purchasing those cards when I came upon a youtube deck review that showed all of the cards. I was stunned at how fast and clear was my interpretation of each one. Just a quick look at an image allowed me to understand it in my own way. At that point I knew that I must have them. The cards are amazing and so versatile that they can be interpreted in a number of ways, depending what suits one the most. I like the fact that there is no numbers or descriptions/ key words written on them as is the case in many oracle decks. There is also no info on the specific cards in the guidbook. The added booklet has just some useful tips on ways you can use the cards like spreads or daily draws and on combining the 2 decks. There is no specific system to the cards or a given explanation of the meaning so each user can work with them and interpret them the way they see fit.